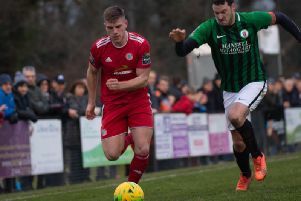 Adam Hinshelwood says there's more to come from his Worthing side - despite them sitting second in the Bostik League Premier Division after five games. Worthing have won four and drawn one of their opening league matches, after winning 2-1 at Haringey Borough on Saturday. Although pleased with the start Worthing have made, manager Hinshelwood feels his side have only played well for 45 minutes so far this season. He said: "I'm really happy with what we've done so far. "However the best we've played was in the second half against Burgess Hill and we only got a point that day but ultimately we're going to be judged on the results we get. "I've only really been happy with 45 minutes so far out of the first five games and the players would say the same. "There's still more to come from us. There's better performances individually and collectively as a team to come but the good thing is we're still a team that wants to learn, progress and get better. "We're still picking up results which bodes well. Last year we would have conceded in the Carshalton and Haringey games but the younger players are learning as well and we've learned what it takes and what is needed to see out games and get results. "We want performances to now be better and for us to be more entertaining. "There were long parts of the game on Saturday again where the fans weren't really getting the entertainment. "That's a little bit down to the opposition making it difficult but we've got to find ways to be better and give our fans more to cheer about. "At the same time, I still want us to have that nous to win games." Worthing fell behind after 27 minutes at Haringey but quickly levelled through Alex Parsons just two minutes later. Former Brighton striker David Ajiboye then volleyed home ex-Gillingham midfielder Jesse Starkey's cross for the winner on 49 minutes for his fourth goal in five matches this season. Hinshelwood said: "In a tight game, you look at those players who can provide that bit of extra quality. "Every game we've had so far has been tight and we've probably just found that bit of extra quality from somewhere. It was Jesse's turn on Saturday just to get that extra half a yard and he put in a great ball and David coolly tucked it away. "We've definitely got that bit of quality in there but we don't want to be reliant on players having to produce that bit of magic to get us results week in, week out. We want to be doing it as a team and creating more than what we are. "That said, you can't fault the effort and the nous we're showing to win games of football." Hinshelwood added teams are sitting back to make life difficult for Worthing and has taken that as a compliment to his side. He said: "Haringey sat back in and made it difficult for us. It's hard to play fluently and the way we want to play at times when teams do that. "But it's down to us to find a way to break teams down and be better. "It is difficult, you've got to pay a compliment to these teams for doing that. They're at home and they've set up with everyone behind the ball to try and get a result. "As much as our fans might look at it and think we're not playing well, let's not forget the league we're in and the opposition we're playing against. "We're playing against good teams with a good calibre and they're making it hard for us. "We're doing all we can and will look and analyse where we can get better. That's what we did last year and what we'll continue to do so this year. "We'll see what we can improve on for each game." Despite sitting second in the table and three points behind leaders Tonbridge, who have played a game more, Hinshelwood will not be looking at the league table any time soon. He said: "I'll look at it whenever we've got enough points needed to stay up. "We're probably 27 points away from being safe. As soon as we get that, we'll start to look at other things." Worthing travel to Faversham in the FA Cup first qualifying round on Saturday.